I thought this would take a while to get funded, much like other crowdfunded project I’ve seen. But once I saw the money raised hit nearly triple digits by the middle of the day, It was only a matter of time. Lab Zero needed $150,000 to finish up creating Squigly, Skullgirls‘ first DLC character. 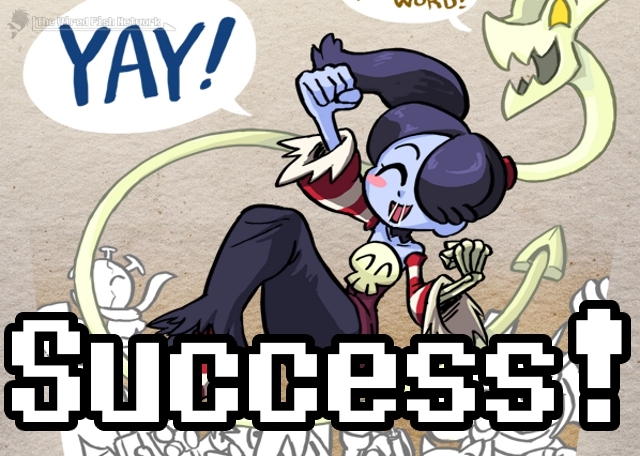 With $218,361 raised as of this writing, Squigly surpassed her general funding. Also surpassing $175,000 stretch goal, she will have her own stage and story mode added upon release. Speaking of which, she will be free buy for everyone for the first three months, becoming paid DLC afterwards for anyone who didn’t get her. Those who already got her will keep her free of charge. So now all eyes are set on Big Band, the first male character of Skullgirls and the big character of the bunch. The story surrounding Big Band is that he was beat to a pulp by his crooked division when he lived as a beat cop (with his real name, Ben Birdland). Living in an iron lung, his story catches the attention of the Anti-Skullgirl Labs. They offer to rebuild him with machinery that make him both mobile and breathe better, and he agrees. He remains with the ASG, becoming a senior member and a sort of father figure to the newer, younger members of the soldiers. He attacks with an array of instruments, like brass and woodwinds, and percussion. Like Squigly, he too will be free for three months upon release and becoming paid afterwards for those who missed out. The goal for Big Band’s creation and playability is $200,000, (reflected as $375,000 since he’s combined with Squigly’s campaign as a stretch goal). He costs slightly more than Squigly since he hasn’t even been put in the game yet. and is still in the concept stages. His stage and story mode will cost an extra $25,000 (same amount as Squigly’s stage and story mode, reflected as $400,000, again due to campaign combination). So if you’re feeling extra generous, head on over to the Indiegogo page and fund it! If you want to know why Lab Zero needs funding, read yesterday’s article on it (second to last paragraph). This entry was posted in Gaming News and tagged Autumn Games, big band, crowdfund, fighting game, free dlc, indiegogo, konami, lab zero, Lab Zero Games, reverge labs, sax deka, skullgirls, Squigly on February 27, 2013 by Steven T..